At a press conference on 31 October 2006, the South African Observer Mission (SAOM) announced that the presidential and provincial elections “were conducted in a climate conducive for a democratic expression of the will of the people of the DRC,” in the presence of the witnesses of the political parties as well as both the national and international observers. The leader of the SAOM, Mr. Mluleki George, South African Deputy Minister of Defense, said that there wasn’t “any major incidents or irregularities with the voting process” that can have an impact on the results. And in case there are concrete irregularities raised up by any of the parties, there is the judicial court who deals with that, thus “I encourage the use of the legal process and not the violence to protest,” he declared. 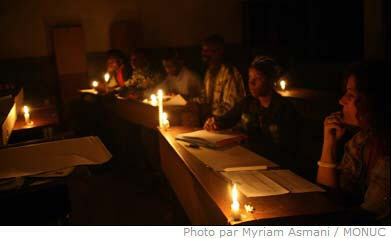 However, the SAOM noted some incidents of violence in the Equator province, where two people were killed, and in Ituri district where two IEC staff members lost their lives as well and eight others were injured. The SOAM applauded the effort of those who conducted civic and voter education, such as the IEC, the political parties, civil society and NGOs. “The electorate was reasonably informed and had a good sense of where their polling stations would be located and how to vote,” he stated. The SOAM expressed thanks to the IEC, the Congolese National Police (PNC) and the two presidential candidates for their joint efforts and commitment to peaceful Election Day. In regards to the low turnout in some cities such as Goma, in North Kivu, Mr. George said that it is too early to know the cause of the reduced turnout now.